I got this media packet from the Grandma Lucy's booth at SuperZoo, but the sample of food inside was actually Artisan Chicken and not their Pureformance blend. 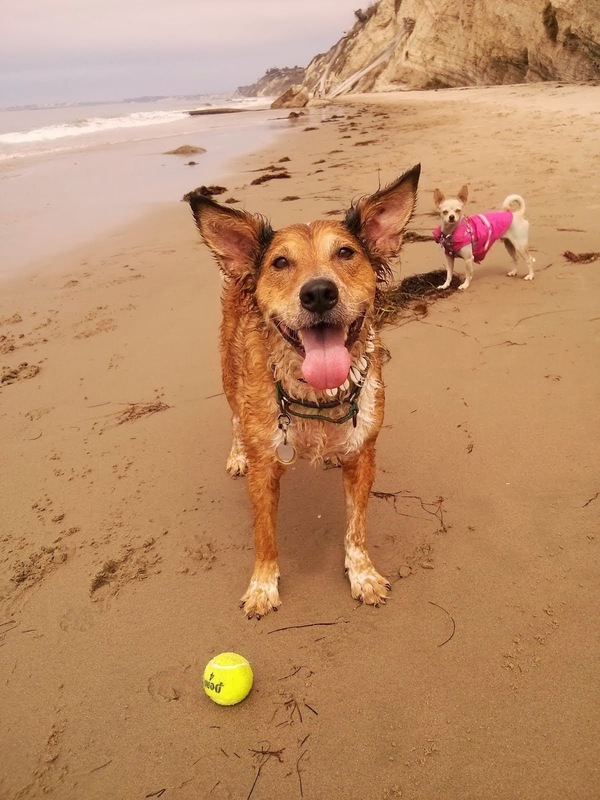 This company specializes in grain-free freeze-dried pet foods with short ingredient lists. I've seen it a couple of times in independent pet stores, and I'm pleased to finally try it. Grandma Lucy's makes all their food in their own facility in southern California, where I currently live. Yay for local food! They have a whole history of the company on their website, with pictures of their dog Lucy, who inspired the company. They even shared how the massive pet food recalls of 2007 resulted in them adding complete diets to their product line. Yay for real people behind the business! They develop a direct relationship with all of their ingredient suppliers to ensure quality. Yay for reliable sourcing! My only scruple is that they proudly state that their food is GMO-free. Boo for anti-science. Ok, the first thing I want to point out about this food is that it is freeze-dried, but in powder form. That's unique so far here on The Dog Geek. 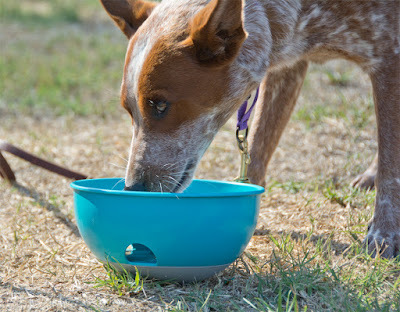 The powder-form dog foods we've tried, Honest Kitchen, Spot Farms, and WellyChef, are all dehydrated. The freeze-dried foods we've tried, Stella&Chewy's, Nutrisca, and Wysong Archetype, all come in chunks. Grandma Lucy's comes with a few big chunks just to show off the lovely meat, but most of it is sort of flakey powder. The second thing I want to share is that I have a digestive disorder that makes eating interesting, and one of the few foods I don't have issues with is mashed potatoes. While I greatly prefer, you know, actual potatoes, I'm willing to settle for instant potato flakes. The reason I'm telling you this is because Grandma Lucy's Artisan Chicken dog food set off the "Woohoo! Mashed potatoes!" part of my primitive lizard brain as soon as I poured water on it. Yes, it's a potato-based food, I just didn't realize quite how potatoey until that moment. Clearly Grandma Lucy's has done a smashing job of maintaining the fresh tasty goodness of their ingredients. Dog Food Advisor awards this particular recipe four out of five stars, it's a plant-based food with a good ratio of protein and fat to carbs. The entire Artisan line of foods rates 4.5 stars on average, while Grandma Lucy's Pureformance foods rate five out of five across the board. The Artisan product line is more affordable, and plenty of dogs do well on potato-based foods. Pureformance uses Chickpeas as the primary carbohydrate source, and the new Valor food line uses quinoa, which is surprisingly not a grain. Sisci Godzilla ate the Artisan Chicken food immediately. Zip also enjoyed it. Ru wouldn't touch it. He's not a big fan of chicken though, so I'd like to try some other Grandma Lucy foods with him. They have some great alternative protein sources, like goat, venison, and rabbit. I need to find someone that sells the smaller bags though, I've only ever seen huge expensive bags in stores, and I'm just not ready for that kind of commitment. Have you tried Grandma Lucy's food yet? How about their treats? 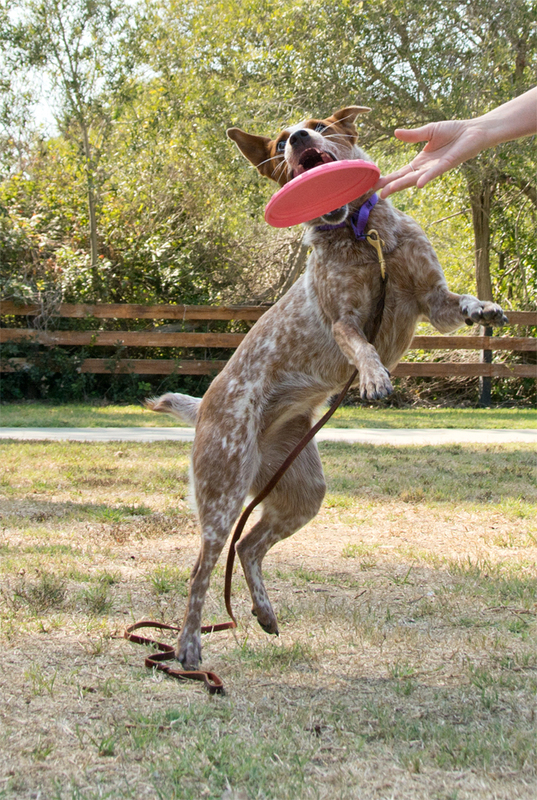 SodaPup's Bottle Top Flyer is a soft rubber disc that flies remarkably well. Made from natural rubber, it is recyclable, non-toxic, sustainable, and easy for dogs to pick up. The Bottle Top Flyer is available in two sizes and three different materials. 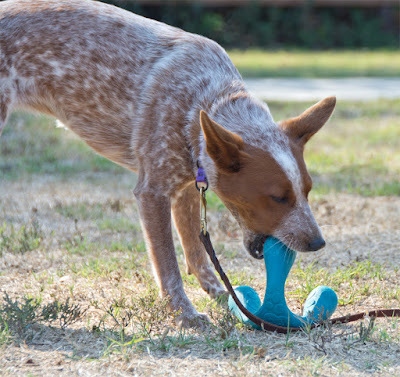 There is an extra-soft disc for teething puppies, a highly durable disc made from SodaPup's Magnum compound, as well as disc made from the regular Puppyprene rubber. I love SodaPup's products because every single one of them is based on a non-dog object. Most dog stuff is dog-themed, have you noticed? Bones and paw prints are everywhere, on leashes and food dishes and dog sweaters. I honestly find it a bit silly, it's not like anyone assumes a collar is intended for a goat or alpaca because it doesn't have bones on it. "HEY, this DOG collar is for DOGS!" Yes, we get that. Put something more interesting on there. That's why I like SodaPup, they looked elsewhere for inspiration, and found it everywhere. From soda cans and beer bottles, to rocket popsicles and ring pops, every toy is loaded with nostalgia. Why make a dog toy shaped like a dog toy, when you can make it shaped like something else? I was given the Bottle Top Flyer at SuperZoo, and the dogs think it is awesome. I think it's pretty awesome too, most rubber disc toys don't fly like this. Ours is the smaller 7" disc, and Sisci Godzilla likes it so much better than our 9" competition discs. I ended up buying a couple of Hyperflite Jawz discs this size for our first competition this weekend. The Bottle Top Flyer is shaped like a bottle cap. It's easy to throw and floats nicely through the air. I don't have to worry about bonking anyone in the head with a bad throw, and it's really easy for the girls to get off the ground when it lands. Pros: Durable. Puncture-resistant. No fabric cover to be shredded. Does not crack like cheap plastic discs. Actually, really throwable. Soft and gentle on mouths and faces even in frantic mid-air catches. comes in multiple sizes. Cons: Is not allowed in dog disc competitions. Doesn't really work for throwing a roller, in which the disc rolls along on its edge like a wheel. 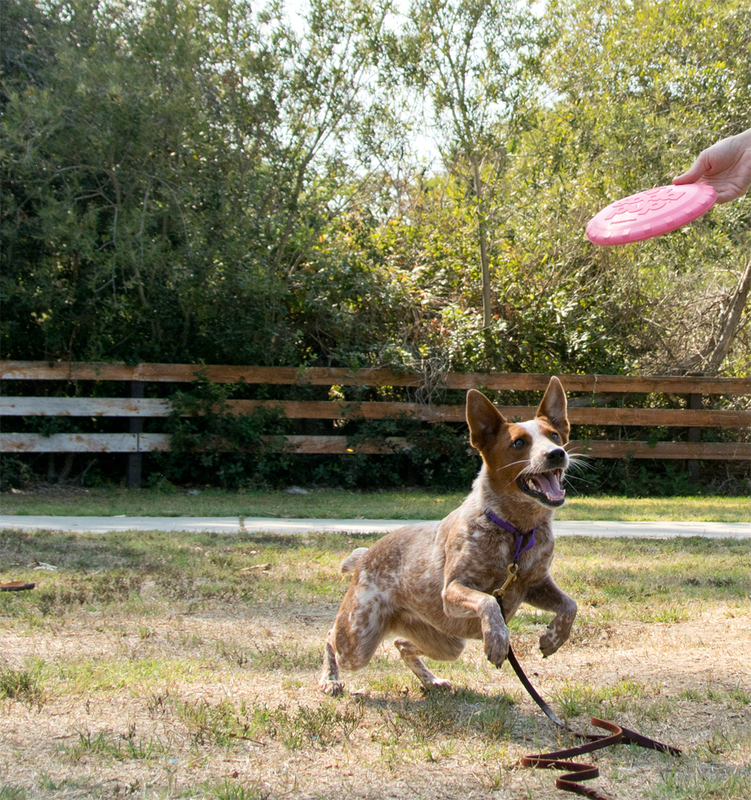 Bottom Line: I really like this disc for introducing dogs to the concept. It's very easy to throw, and it flies stable and slow so it's easy to catch. I got some samples of jerky treats from Benni and Penni at SuperZoo. They also had samples of some brand new treats that hadn't hit the store shelves yet. One of them was full of ginger root, and intended to help dogs with motion sickness. Sisci gets carsick occasionally, and I found this concept intriguing. I haven't seen anything like it. Unfortunately, Benni&Penni did not have have samples of the ginger jerky for me to take home to my dogs. They didn't even have packaging for it yet, yet a cookie jar full of jerky for conference attendees to touch and smell. It smelled really good. This is a feel-good company founded by someone who made some awesome treats for their pet and wanted to share with the world. The company produces their treats right here in Southern California, and even their packaging is made in the USA. They dehydrate their treats, so the jerky is soft and chewy just like beef jerky for people. I personally refuse to each jerky that crunches. 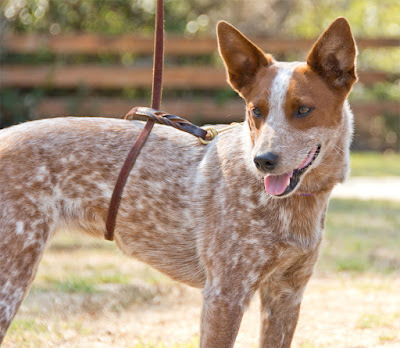 Good For: Peppy cattledogs that like food. Training treats, the pieces are scored so they're easy to break into the right size. Staying soft even after the bag is opened. Dogs with food allergies to anything but duck or peas. Not Good For: Picky chihuahuas and border collies. How Much We Like Them: I need to find a local store that carries these. It really shouldn't be that hard, right? 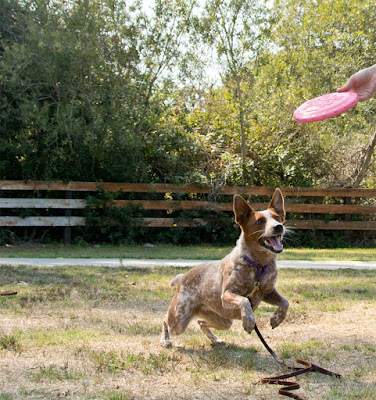 Kyra Sundance's 101 Dog Tricks is big, pretty, and filled with photographs. 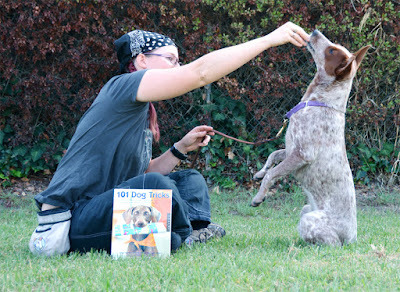 This is a start-anywhere sort of book, its' basically a dictionary of dog tricks. The training methods demonstrated are fun and force-free, and the information is fast and accessible. Suitable for brand new dog owners up through experts, the book can be used as anything from a training bible to a source of ideas. 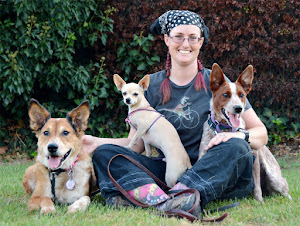 Kyra Sundance is also the entrepreneur behind Do More With Your Dog, the titling organization for dog tricks. She travels around the country doing demos and classes, and her breed of choice is Weimeraners, oddly enough. Her dogs are prominently featured in the book, but there are many other breeds as well. This is a 208-page book, and each trick gets at least one page. The tricks start out simple, with groundwork behaviors like 'sit'. 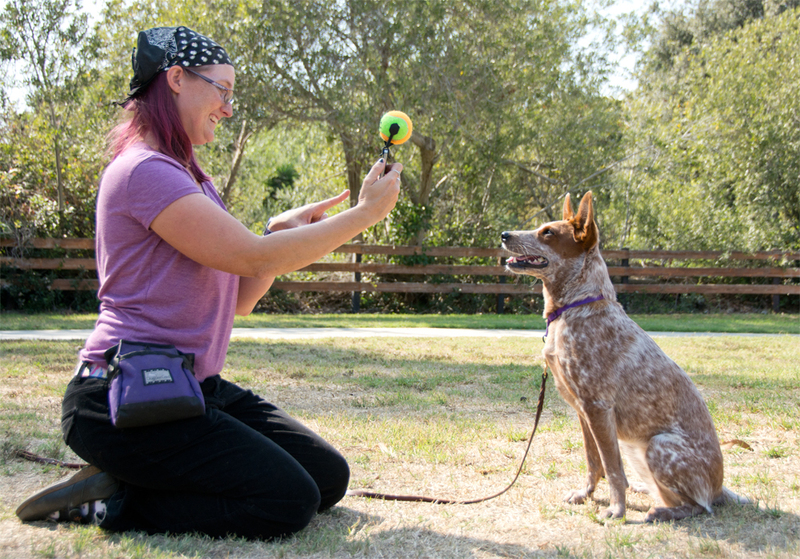 Each trick includes step-by-step instructions for teaching it, along with the behaviors your dog needs to know ahead of time, training tips, and troubleshooting help if your team isn't quite getting it. I find 101 Dog Tricks to be a rather utilitarian book. It has a couple of pages on basic training technique, and tons of pretty pictures, but the trick instructions can be a bit sparse. There's the step-by-step, and usually a troubleshooting tip, but for the most part it reads like "do this, and your dog should do that, if he doesn't, try doing this instead". Sometimes I end up going "Welp, my dog didn't do that, so now what?" My favorite example is attempting to teach Sisci Godzilla to jump over my back by holding up a jump bar. She instantly decided that zooming under the bar was the best thing ever, and it must have been somehow inherently rewarding because she keeps doing it despite my desperate lack of reinforcement. Sometimes it makes agility class very interesting. That said, it's a fun book. It's a going and doing book, not a sitting and reading book, if that makes sense. 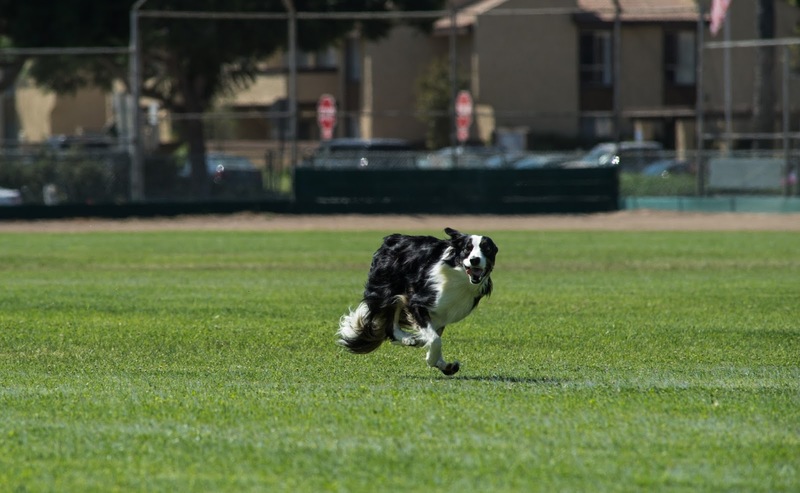 You can flip to any page, get an idea, and run off to train your dog. I think that makes it less daunting, there's not a ton of information to absorb. 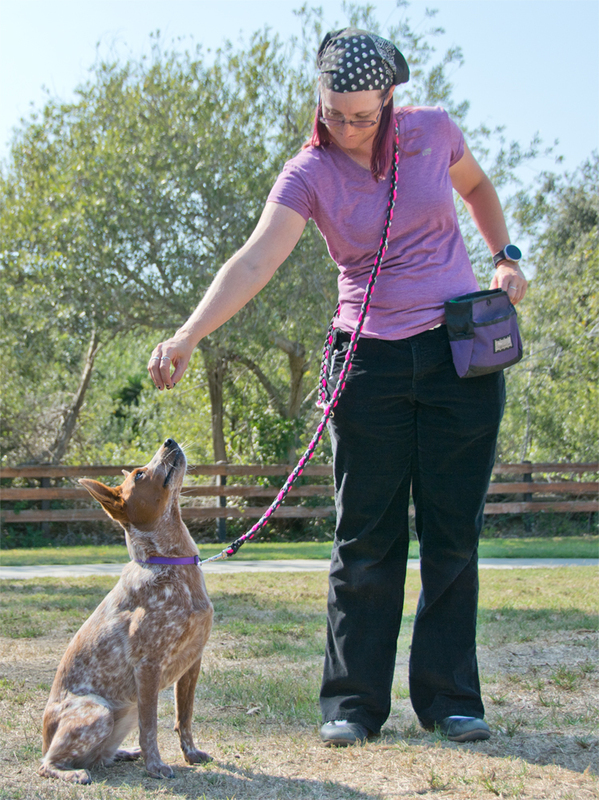 If you and your dog aren't getting one trick, turn the page and try another one. I get most of my trick training ideas and tips from various groups online. The entire reason I purchased this book was because I wanted to earn trick dog titles. These can be earned by submitting videos and sending in an application, but the tricks listed on the forms are really quite vague. 101 Dog Tricks acts as a reference so you can figure out what "my dog can count" actually entails. Brisbane and Godzilla both got their Novice Trick Dog titles, complete with big fancy certificates and letters after their names. I have everything I need to send in the information for their novice and advanced titles, but I haven't gotten around to it yet. The Paw5 Rock N Bowl combines the convenience of a bowl with the enrichment of a puzzle toy. I know, some nights it's just too much work to funnel kibble into a toy. I've definitely been there. Apparently so have the folks at Paw5, because they've basically invented a self-filling food puzzle. Sure, it's shaped like a bowl, but it's way, way easier to fill and clean than the puzzle bowls you see everywhere. I think this is also a cool way to introduce the concept of puzzle feeding to both dogs and humans unfamiliar with the concept. It's not some wacky shape you have to screw together. It's a nice, familiar bowl with some extra features. The Rock N Bowl is made in the USA from recyclable plastic. Paw5 uses a closed-loop, zero-waste manufacturing process. Sustainability is awesome! 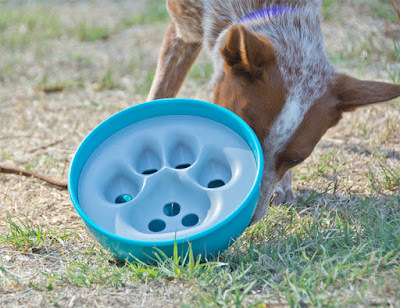 Here's how it works: You dump the food on top and set the bowl down for your dog. Some of the food falls into the lower chamber, which has a flat floor. 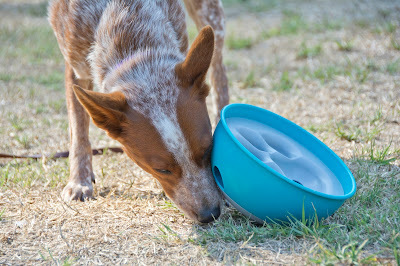 The kibble can then slide out the holes in the side of bowl. There is a ridge in the middle of the chamber floor that prevents the food from sliding freely across the bottom. Too easy? That flat floor can be removed, so that the kibble falls into the rounded bowl bottom instead. It's more difficult to get the food out the side holes that way. 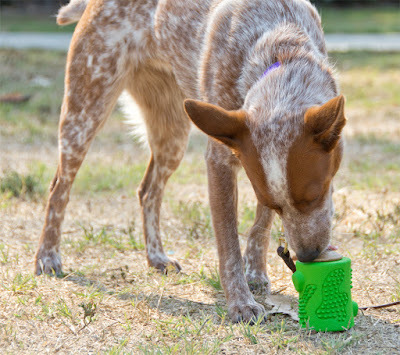 Holds up to four cups of kibble at a time, more than enough for any meal. It can actually be used as an everyday feeding bowl. 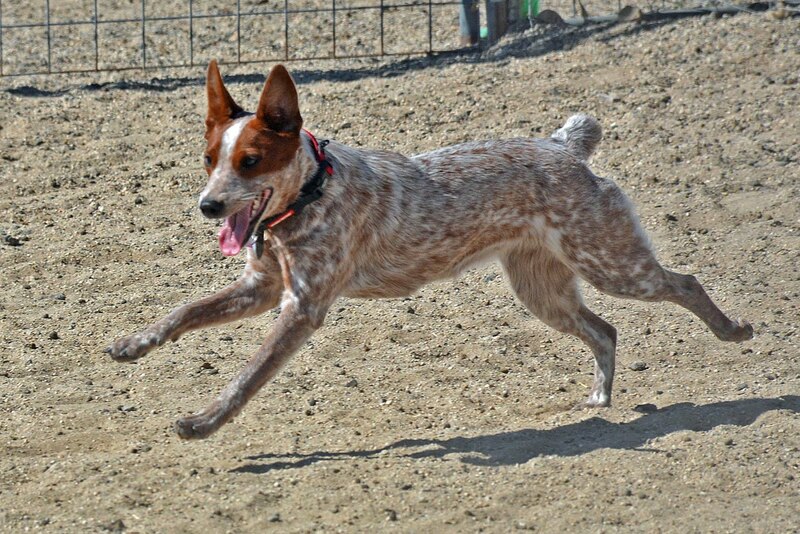 As fast as dumping kibble in a bowl. That fast. It's really easy to get some kibble out of the Rock N Bowl, but fairly difficult to get all the kibble out. With the chamber floor removed, it took Godzilla at least 15 minutes to eat a cup of kibble out of this bowl. It's big enough for a giant breed dog to use, but light enough for Ru to push around without getting squished. Ru has been way more interested in the Rock N Bowl than our other puzzle toys. Sturdy yet flexible plastic. It's not made to be gnawed, but it should be able to handle an infinite amount of being batted around the house or yard. I know, it looks like hard plastic that would be super noisy on hard floors. Someone at Paw5 must have hardwood, because they thought to make the bottom out of rubbery material. The bowl is not weighted, so it doesn't make those super heavy rolling sounds either. It doesn't fit under the furniture, and I pick it up after dinner just like I do all the other dog bowls. The dogs aren't inclined to pick it up and carry it around, either. The bowl comes into three pieces for super easy washing. There are no crevices or hard to reach areas, and it's dishwasher safe. Obviously this is a feeder designed for dogs, and smaller kibbles fall out easier than larger pieces. For that reason, it's difficult to use the Rock N Bowl with cats, bunnies, or rats. The super easy washing aspect means it can be used for animals that get things super dirty, but I suspect Xhuuya the raven would just take the whole thing apart. I'm pretty sure it would work for toddlers though. Might have to load it up with Cheerios and visit some friends. From the makers of the Thundershirt comes the brand new Thundercollar! 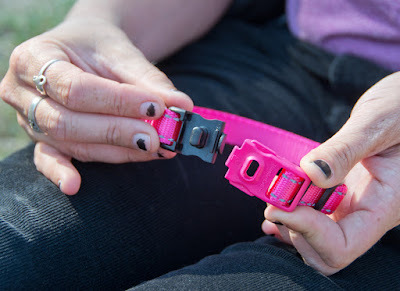 This collar features a unique quick-release closure that solves some of the common issues with plastic side-squeeze buckles. The nylon webbing has reflective stitching for visibility. 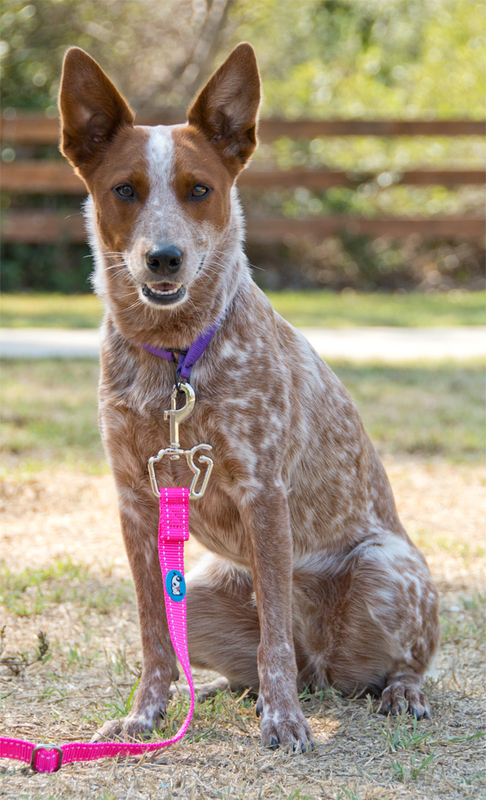 This collar is available in five colors and four sizes to fit dogs with necks 8-26" around. I purchased this Thundercollar at SuperZoo because I could not stop playing with the buckle. It's totally different from every other collar fastener I've ever encountered. Having worked at a, lets face it, seriously overcrowded doggy daycare for years, I have buckled and unbuckled a TON of collars. My first thought when bringing a dog out to the yard was always "How fast can I take this collar off?" The biggest disaster we could possibly face out there was a dog getting their jaw wrapped around another dog's collar while playing. If a collar didn't have a quick release buckle, it came off. If the buckle had a safety lock, it came off. If it had an unusual fastener that I didn't think other staff would instantly be able to operate in an emergency on a panicked dog, it came off. If I was petting the dog and noticed that the buckle was a bit stiff, it came off. If you've ever had to open a standard side-squeeze quick-release buckle under major stress, you're already aware of how difficult it can be. Pressure sort of locks them shut, you need a tiny bit of slack to open them smoothly. I haven't had to unfasten a Thundercollar in an emergency, but the buckle seems to open under stress the same way it does when slack. sensitive ones it can give them yet another reason to feel that the world is not a safe place. Pros: Buckle opens top-to-bottom rather than side-to-side to prevent pinching. Can be opened under pressure, with one hand, without looking. Quieter than a standard plastic buckle. Cons: Slightly tricky to open by itself, much easier to open when it's actually on a dog. 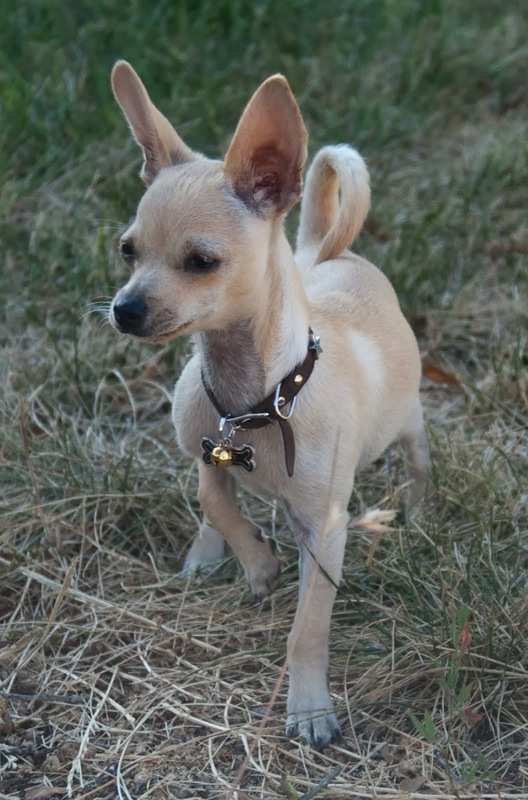 There's no overlap between the small and medium sizes, so if your dog has a 14" neck the small will be a bit small and the medium will be a bit large. 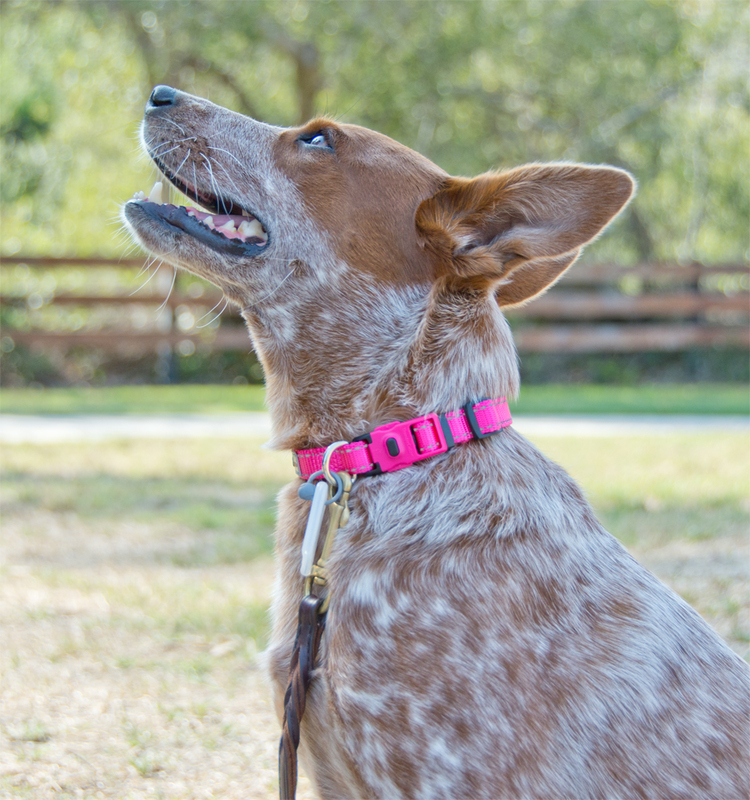 Bottom Line: This is a quick-release safety collar for noise-sensitive dogs, those with sensitive skin, and dogs who require a nice snug fit. 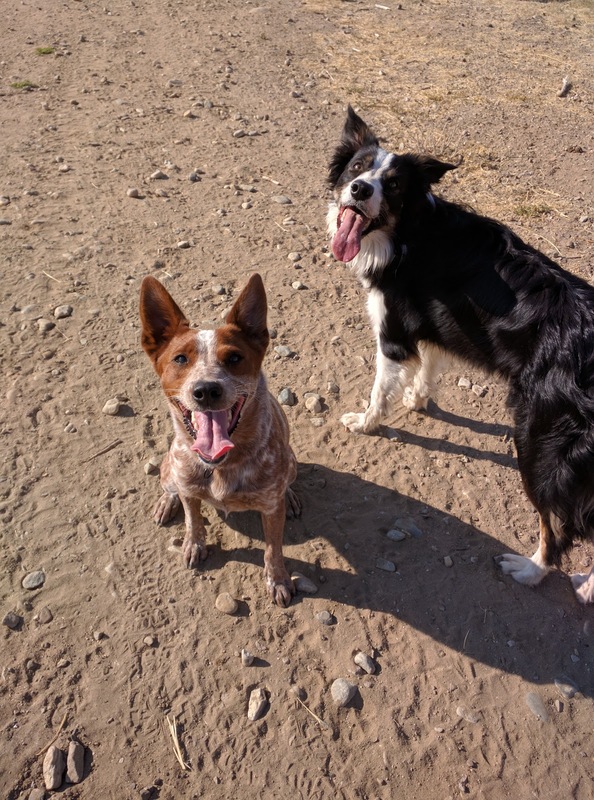 Knowing that lots of pets have food sensitivities, Northwest Naturals made a line of single-ingredient freeze-dried treats called Raw Rewards. These are nice little nuggets made from either, beef liver, bison liver, chicken liver, lamb liver, or salmon. I really like that Northwest Naturals labels these as being for dogs or cats. I've seen other brands package the exact same treats for one or the other, but Northwest Naturals tells it like it is. Ok, I had originally thought that all freeze dried raw liver treats were equally stanky, but it turns out there is a continuum. Pure Bites continues to hold the title of Most Horrible Liver Treats. Bravo Bonus Bites are so far the least odiferous of the 100% freeze dried bovine liver treats we've tried. Raw Rewards are somewhere in the middle. Good For: Dogs with food allergies. Picky dogs. High value training treats. Cats! Not Good For: Breaking into smaller pieces. Though Northwest Naturals recommends this, some of the pieces crumble into powder instead of breaking nicely. How Much We Like Them: Sisci Godzilla likes them (as per usual). Ru actually gets excited about them. Zip isn't so sure about most treats, but she'll eat these. The cats absolutely love them. The Pooch Selfie finally gives us a way to get our dogs to look at our phones! 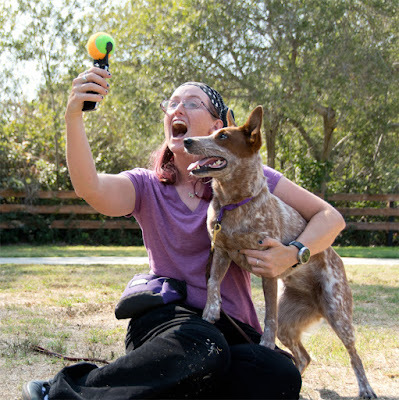 The Pooch Selfie is the result of a successful Kickstarter campaign to make taking pictures of your dog way easier. 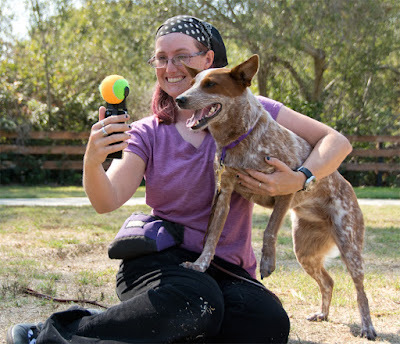 The device consists of a universal clip that attaches to any phone or tablet, and holds a squeaky tennis ball. If your dogs are anything like my dogs, they will fixate on the visual target instantly, and maybe drool a little. Finally, a you-and-dog selfie where both of you are looking at the camera! Ok, so in case you didn't know, getting a dog to look at a camera can be a challenge. My dearly departed Brisbane was carefully trained for a modeling career in his youth, and getting him to look a particular direction was easy. Normal dogs don't have trained eye lines though, and I haven't yet put in the time to teach anyone else that particular skill. Still, getting my dogs to look at Erin's camera isn't terribly difficult. I usually hold treats just out of frame, and we get some pretty good results as long as there is something fun and exciting in the direction of the camera. Taking a selfie with your dog means getting your dog to look away from you, at your phone. Godzilla can take a good selfie, I just look ridiculous. selfies is because my phone is a Nexus 6 and it is enormous. I love it for everything I use it for, but it is so big and ridiculous that I had to borrow an iPhone to take these pictures. There is no way I can hold my phone out at arms length and take a picture. My fingers aren't long enough. If I pursue selfies as a form of self image therapy I'll probably have to break down and buy a selfie stick or something. Anyway, the Pooch Selfie actually works. It's a squeaky attention-getting tennis ball with a holder that clips to your phone or tablet. The only caveat being that your device must be naked for it to fit. I'm not surprised that it doesn't go over my giant bulky ballistic phone armor, but it didn't even fit on the iPhone with a thin slipcover. Naked phones only. Pros: Fits my Nexus 6, my iPad, Erin's iPhone, and every other naked device I have tried it on. Very easy to use, doesn't hurt the phone and holds the ball securely. Fits nicely into my pocket or purse. 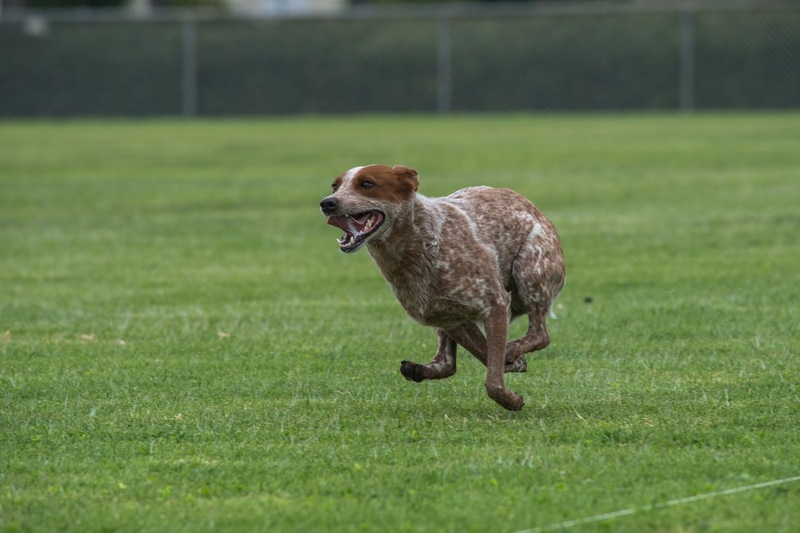 Tennis ball is actually functional, fun, and squeaky. Works extremely well on dogs that are preoccupied with tennis balls. Cons: Will not go over skin-type or box-type cases, but might work with some of the wallet-type cases. May not be as effective on dogs that aren't ball-crazy, unless you can get their attention by squeaking the ball. I do not have the manual dexterity required to squeak the ball while taking a selfie. Bottom Line: I bought The Pooch Selfie at SuperZoo because it was silly and I thought it would make a good blog post. It's probably life-changing for someone who loves both their dog and taking selfies. I may actually share some selfies if I figure out how to manage them wit my gigantic phone. It's Caturday! And We're Eating at Bravo's Feline Cafe! Ok, it's not really a cafe, but Bravo as a new line of canned cat foods called the Feline Cafe. Bravo started out as a frozen raw food company, and I tried to talk the Hellions into eating their food eight years ago without success. Since then, Bravo's cat selections have grown. Yes, I write about Bravo a lot. They sent me home from SuperZoo with a huge bag of goodies, so I feel obligated to share our experiences. They make good stuff. The Feline Cafe encompasses two different types of food. There are three 95% meat or poultry selections, and three single-protein fricasse selections. We were given one of each recipe. James and Solstice inhaled every single variety of Feline Cafe canned food without pause for breath. Admittedly, they do love food, so I'm not sure how a finicky cat would react. I need to ask my local independent pet supply store to carry this stuff. I first learned about the Open Farm company at SuperZoo, and now I think it might be my most favoritest company ever. Open Farm is all about ethically-sourced ingredients, and transparency for the customer. Like, a really ridiculous amount of transparency. There's been a lot of focus recently on the sourcing of vitamins and minerals that go into pet food, and how many dog food companies buy pre-mixed nutrients without knowing themselves where all the ingredients originated. Some companies use multiple suppliers, so a given ingredient could have come from more than one place. It's too much to ask them to keep track of which ingredients when into which bag of food...right? I'll be honest, I'm a big fan of genetically modified food for a lot of science-based reasons. The fact that Open Farm proudly touts its non-GMO ingredients bugs me a lot. I understand it's mostly just a marketing thing, but every company that falls for it just normalizes the fear of perfectly safe food. Otherwise, Open Farm is the most amazing pet food company ever. Seriously. They take transparency to an entirely new level. See, each bag has a lot code printed on it, along with the best-by date. You can go to the Open Farm website and type in your code, and instantly get a list of where every single ingredient came from. From humanely farmed turkey in Pennsylvania, to Niacin supplement from Switzerland. It's not just "Not From China (probably, at least that we know about)" like nearly every other pet food company out there. But that's not all! Open Farm also uses only farm animal products that are third party certified as being humanely raised. That means the chickens, turkeys, and pigs were raised in a comfortable environment with minimal stress, and plenty of space to move around. Prior to being humanely slaughtered for food, these animals were cared for to standards that covered not only their physical needs, but their mental and social needs as well. Humane Farm Animal Care standards include enough dark time for birds to get real sleep, toys and rooting material to keep pigs busy, and housing that prevents social animals from feeling isolated. I think my favorite thing about Open Farm is their commitment to sustainable fisheries. I have a background in biology, and I'm quite alarmed at the state of the world's fisheries. Open Farm wanted to make a fish-based food from sustainably-harvested species, so they started working with the Monterey Bay Aquarium's Seafood Watch program. This program helps identify species that are abundant and can be caught in a manner that minimizes environmental impact. As a result, different batches of Open Farm's whitefish pet foods may be made from different species of whitefish. What kind was your bag made from? Check the best by date and product code, the type of whitefish used is printed in the same place. 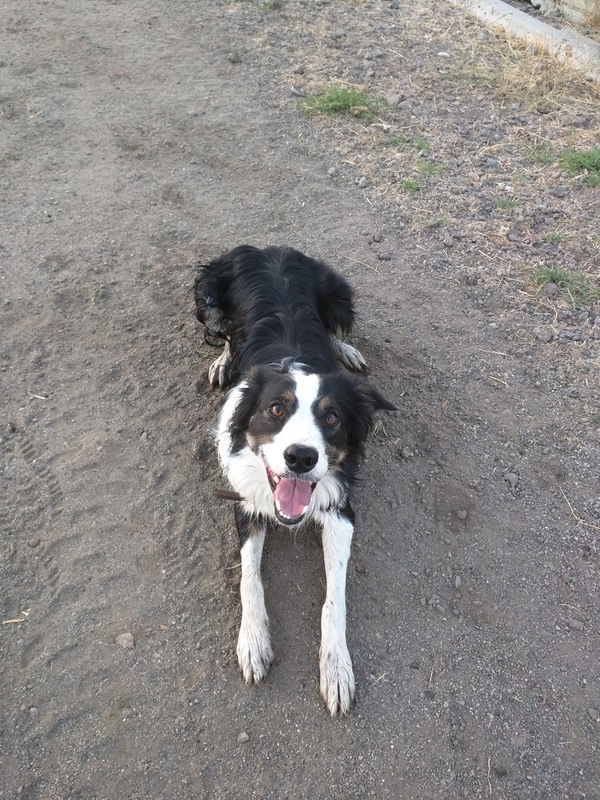 All of Open Farm's dry dog food recipes rate 4.5 out of 5 stars on the Dog Food Advisor website. The foods have a 30/14 protein/fat ratio, which means plenty of protein but not a whole lot of fat. The carb content is a little higher than I'd prefer. I'm pleased to see that the fish recipe is allergy-friendly, Brisbane would have been able to eat this one despite his poultry/egg/sweet potato allergies. The kibbles are also pretty little, so these are nice foods for little tiny dogs. Maybe it's because I feed a lot of high-protein, high-fat foods, but my dogs really weren't that into any of the Open Farm kibbles. Ru is extremely picky, and he wouldn't touch it. Sisci Godzilla was willing to eat a few bites, but I had to top it with Caru Stew to get her to finish the bowl. These seem to be worthwhile foods to try for dogs with tummy issues, and I would recommend them over super-dense foods like Orijen for senior dogs unused to that much protein. I bought this Multipurpose Leash from Leashes by Liz at SuperZoo. It has a snap at either end, and fouro-rings braided along its length. This leash is made from braided paracord, and it is quite sturdy. These are made by hand in Colorado, and are available in stores around the country. Leashes by Liz offers them in a multitude of color combinations, with other styles and coordinating collars also available. I am a big fan of utility leashes, but I'm not thrilled with the ongoing braided paracord fad. Most of the paracord leashes I encounter are stiff, bulky, and uncomfortable to hold. When I spotted these at SuperZoo, I knew they were something different. These are braided like I braid my hair, not like a survival bracelet. 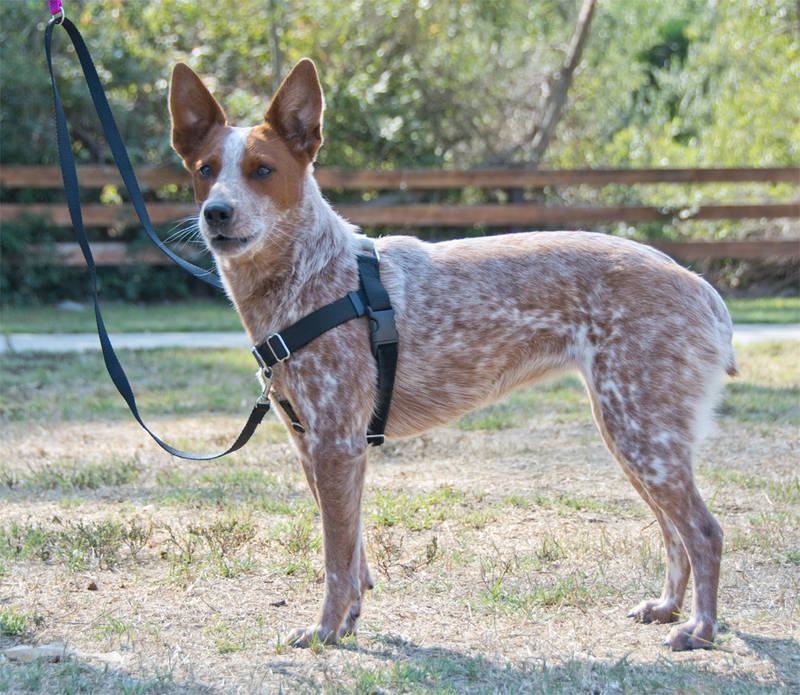 The leash is flexible, comfortable to hold, and quite substantial. Though I really prefer to use light leather leashes, Sisci Godzilla has taken to biting through them when she gets excited. She doesn't gnaw, she just snaps once or twice and I'm down yet another leash. This has led me to acquire some more substantial leashes to hopefully keep her and everyone else contained. Multifunction utility leads come in a ton of different configurations. They are largely defined as having a snap at either end, and some number of floating and/or fixed rings all along their length. A lot of utility leashes have very heavy hardwear that tends to swing around and hit the dog if you are super clumsy (I am super clumsy). 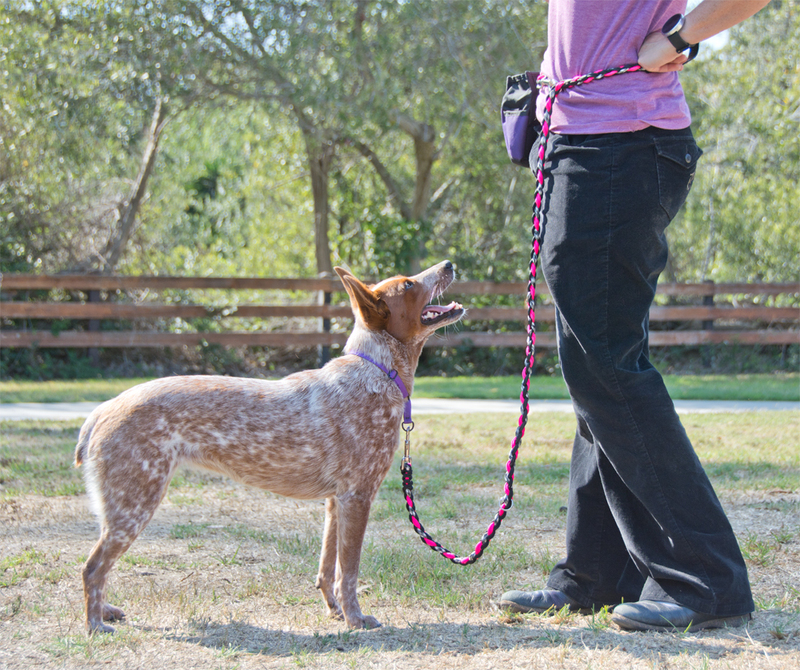 This Multipurpose Leash has four rings braided along its length, and they are integrated incredibly well. 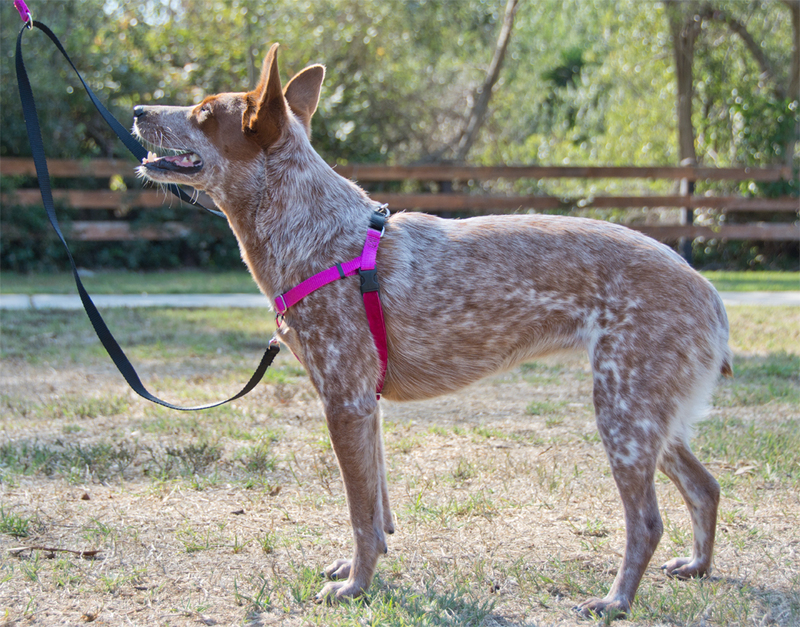 The o-rings are not heavy enough to weigh down the leash, so they aren't super noticeable when not in use. With so many options, this leash is often in use around here. I most often use it to walk Godzilla and Zip at the same time when I need to get them from the car to the house. I also use it as a tie out at work, either snapping the leash to itself around an object, or just snapping it directly to a fence. Sometimes I clip it around my waist, or over my shoulder. It also works well with the Freedom Harness, and any other no-pull harness with two points of attachment. 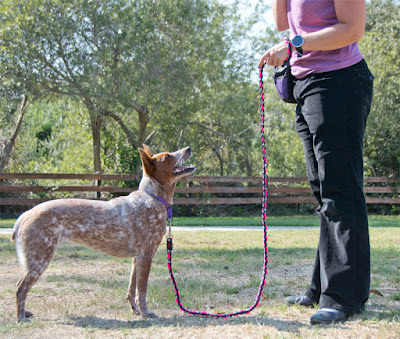 Leashes by Liz has a demo video where they also suggest using the Multipurpose Leash as a mobility aid. 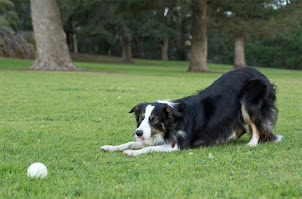 It's long enough and has enough rings that it can be wrapped around the dog's waist to help keep their rear up. It would also work very nicely with the Help 'Em Up Harness, clipping to the front and rear rings to help support the dog. Pros: Durable. Bite resistant (though not bite-proof). Strong and sturdy without compromising functionality. Ring placement gives it many different uses. Made in the USA. Comes in tons of colors. Cons: The actual clips are a bit heavy, though that may be a plus for some. Using a paracord leash makes my inner hipster twitchy. Even more so when I showed up at agility class and my instructor was using the exact same leash. Bottom Line: Leashes by Liz managed to make a paracord leash so different from all the other paracord leashes that I actually bought one. And now I use it. A lot. It's just so incredibly functional. I'm ridiculously excited about Starmark's new RubberTuff toys. These are supposed to be a bit tougher than some of the Everlasting Treat toys (see the edit below, they're actually not). They're made out of a different material, they don't specify but it looks like natural rubber to me. The whole Rubber Tuff line is made to work with Starmark's new Lock & Block treats. The new toys come in three sizes, and three shapes. I have the Rubber Tuff Stump, there is also a ball and a bone. While I did purchase my toy, I was given a discount at SuperZoo. I am a big fan of Starmark's Everlasting Treat toys, but that design has a weakness that some dogs figure out how to exploit immediately. Whether it's the Bento Ball, Wheeler, Groovy Ball, or the original Treat Ball, Everlasting Treats are inserted into the toy by popping them under a rim. That rim is an ideal point of entry for dogs that like to rip off chunks of toy with their front teeth. 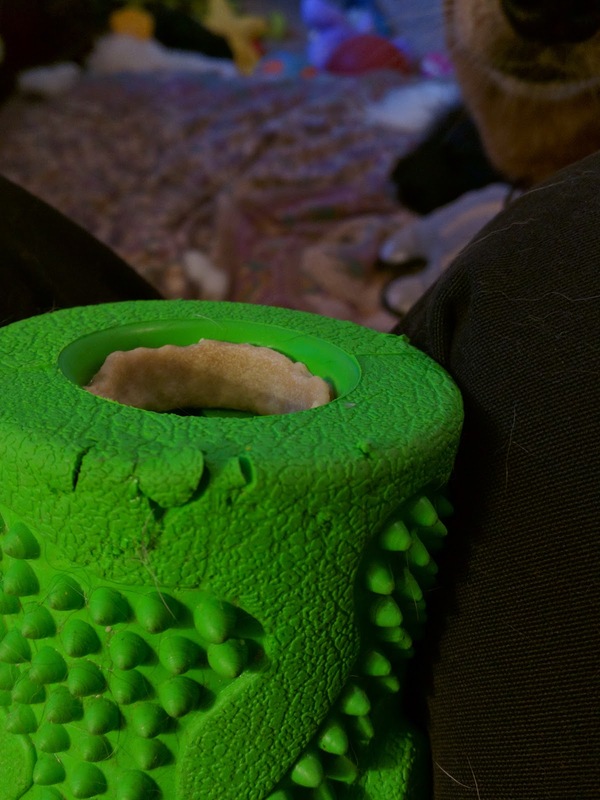 The new Rubber Tuff toys still use a rim to hold the treat in place, but now the top of the treat covers that vulnerable spot. There aren't any obvious weak points in the toy itself when the treat is inserted. However, I am interested to see if any of my product testers manages to get their teeth under the treat in order to pull it straight out. It took a lot of force to get it in there, so hopefully the designers at Starmark have already planned for that possibility. The inside of the toy is hollow, with Starmark's usual lobed openings on either end. 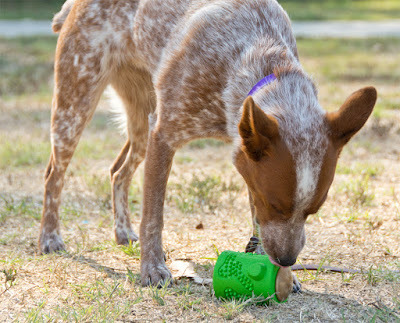 The Stump can hold two Lock and Block long-lasting edible chews, and smaller treats can be stuffed into the middle. Pros: Dishwasher safe. More chew-resistant design than previous Starmark treat-holding chew toys. Textured surface may help clean teeth if your dog chews it just right. My dogs find it a little more appealing than the Everlasting Treat toys. The treats are made in the USA. Cons: Lock & Block treats only come in one flavor right now. Bottom Line: I must admit, this toy really looks like the unholy offspring of an Everlasting Treat Ball and a Kong. I just put our second round of Lock and Block treats in the Rubber Tuff Stump, and it appears this toy's durability is severely lacking. Sisci has managed to gnaw chunks out of it just by eating the treats. She's not a deliberate toy shredder, so I'm surprised that the Stump didn't hold up to the amount of chewing it appears to be designed for. I am going to contact Starmark to share my experience, and will report their response. 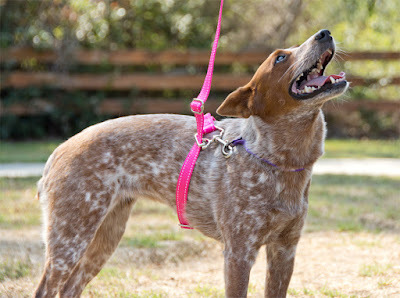 I'm a big fan of the Freedom No Pull Harness by 2 Hounds Design. I recommend them to clients, and own several. However, I did have some fitting issues with Brisbane because he was very sensitive about straps crossing his shoulders after he developed hip arthritis. On the 1" wide medium and large sizes, the chest straps sat too low. One of my local stores carries Freedom Harnesses in nearly every size. They have the 5/8" strap width harness in extra small and small, and the 1" strap harness in size medium, large, XL, and 2XL. The only size they don't carry is the 5/8" wide medium. Since the store had all of the other sizes, I was able to compare them side by side. The first thing I noticed was that the martingale loop on all of the 1" harnesses was the same size. The small and extra small harnesses had a smaller loop, but it was also the same size for both. This led me to believe that the medium 5/8" harness would also have the smaller loop size, resulting in less distance between the buckles, and therefore the chest straps would sit a little higher on the dog. Both size medium harness are listed as fitting dogs with 22-28" chests. The one with the thinner straps seems to be difficult to find, so I was delighted to see an entire rack of them at the 2 Hounds Design booth at SuperZoo. On comparison, I found that the 5/8" harness did indeed have the smaller loop and less distance between the buckles. 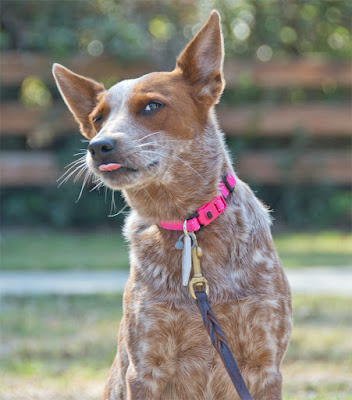 I purchased this bright and cheery raspberry-colored 5/8" medium harness at a discount so I could compare the fit on my own dog. I don't really use the Freedom Harness on Sisci, but I am a huge nerd and couldn't pass up the opportunity to answer this burning question. The fit between the two sizes is pretty close, but the harness with the thinner straps does sit a bit higher on Sisci's shoulders. I don't know that it would make a dramatic difference in shoulder movement, but it's worth considering when choosing between the two sizes. I think the 5/8" strap harness fits a little bit better, and droops in front a bit less. I was given this Yup! Marrow Ring at SuperZoo, and it has been a hit. Designed by the Sporn Company, this is a durable chew toy with a center made out of meaty jerky stuff. Dogs can smell the inner filling, but have to chew though basically the whole bone to get to it. That project can take them months, and even people with power chewers seem to report that these things last. This is a big bone, 7" long and recommended for dogs over 40 pounds. Before SuperZoo, I had not encountered these MarrowChews bones. A lot of dogs just don't see the point of gnawing an inedible nylon bone. 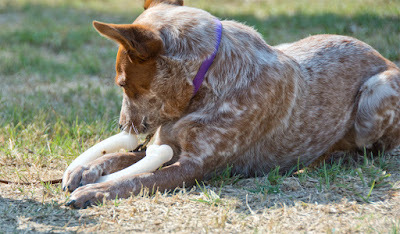 Nylabone claims to flavor theirs, though having licked a few I have a hard time believing that. (Don't judge me!) Benebone actually makes their nylon bones out of bacon or peanut butter. FlavorIt bones are full of holes so you can add your own flavoring. Yup! has done something completely different, putting something worth chewing for inside the bone with holes that allow the dog to smell and taste it a bit. Pretty much every collection of reviews rof dogs won't chew something inedible. I was unable to find any reports of dogs destroying these bones. Quite a few owners reported that these were the only toys their power chewers could enjoy. I also failed to find any reports of dogs breaking their teeth or injuring their mouths on MarrowChews. Pros: Stands up to the toughest chewers. Way more interesting than a plain nylon bone. Cleans teeth as the nylon shaves off in little ragged bits. 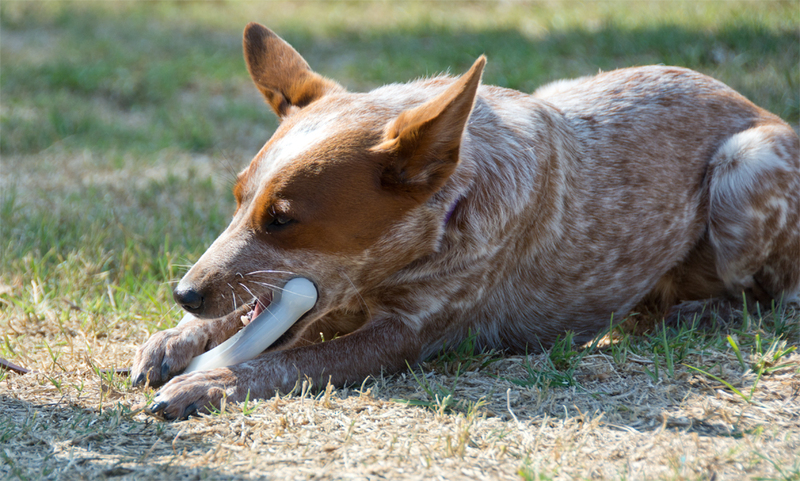 Lasts longer than pretty much any other durable nylon chew bone. 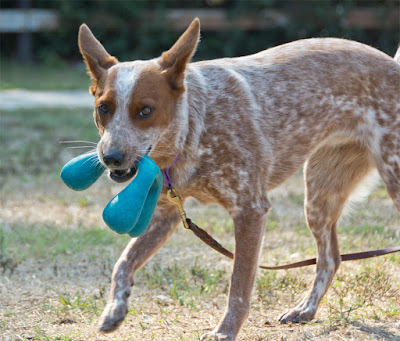 U-shape is a convenient shape for dogs to carry and hold. Cons: Like any chew toy, not every dog will be interested in it. Bottom Line: I need to find a power chewer to really put this bone to the test. Alpine Outfitters can barely keep up with the demand for their original custom Urban Trails Harness, so they've introduced a ready-to-go adjustable harness in standard sizes. 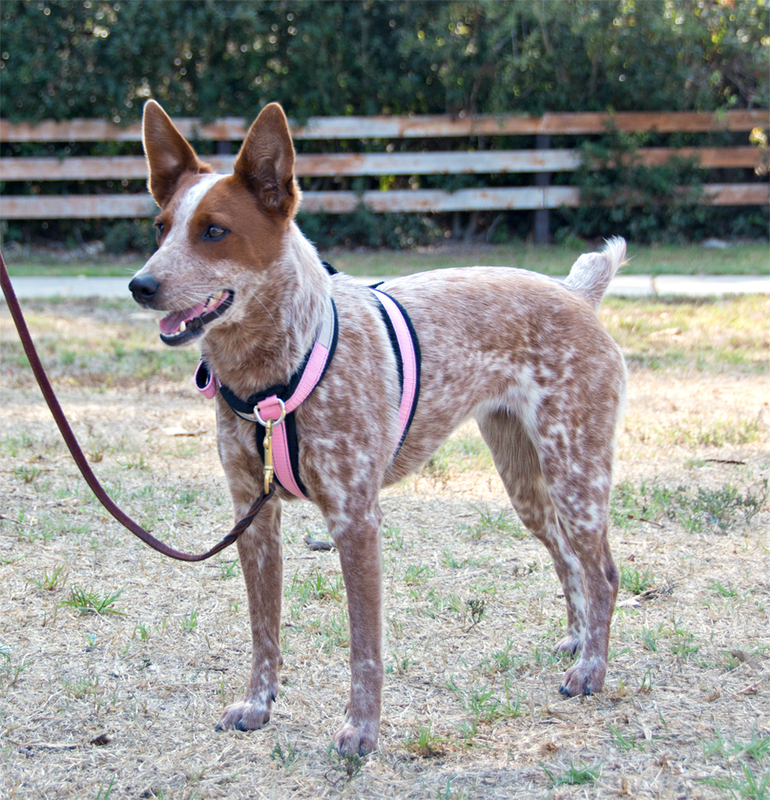 Don't want to wait for a custom-sized mushing harness? Need something that buckles at the neck for your head-shy dog? 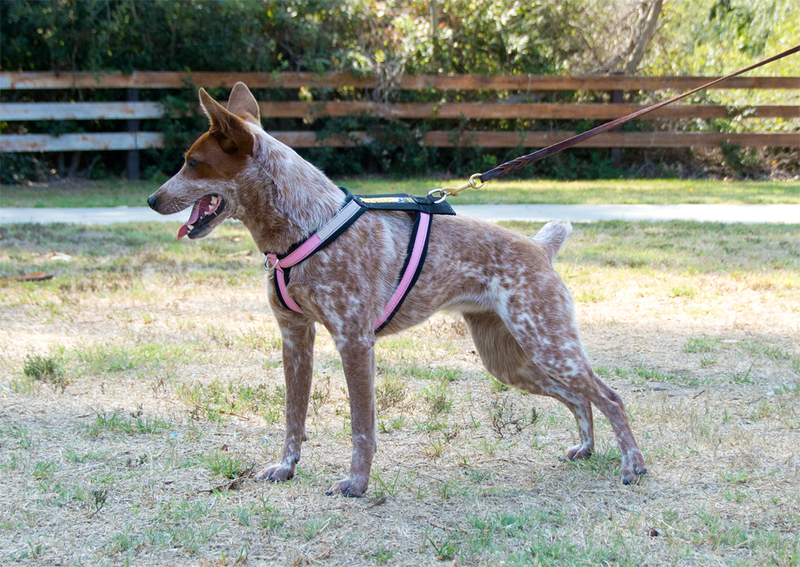 Want one harness that can be adjusted to fit multiple dogs? 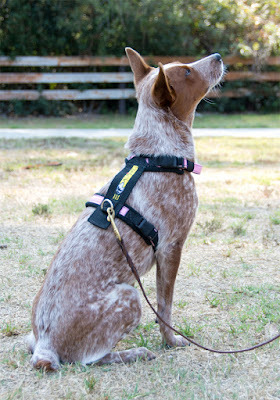 The Urban Trails Ready-to-Go Adjustable Harness comes in four sizes and five colors to fit dogs 25-95 lbs. 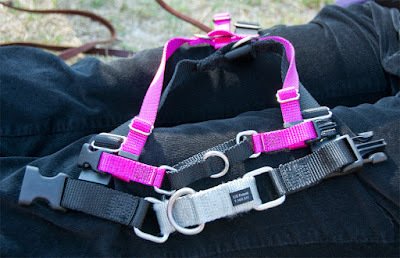 Once upon a time, back in 2005, I ordered an Urban Trails custom mushing harness for Brisbane. He was only eight months old, and I had grand plans involving scooters and trails and sled dog commands. Unfortunately, Brisbane was not a fan of pulling. In retrospect, I could probably have done more training to teach him that it was cool, but I did put quite a lot of work into it. Several years later, I realized Brisbane had outgrown his custom harness. I contacted Alpine Outfitters about possibly having his original harness altered, and they sent me a brand new custom harness in exchange for the old one back! That happened several years ago, so I was stunned when I met the people behind the company at SuperZoo, and they actually remembered me. They asked if I had another dog and then gave me a brand new ready-to-go Urban Trails harness for Sisci! I had been seriously considering ordering one to see how it compares to the custom Urban Trails, but I got this one free in exchange for my review. I was sure that the addition of adjustment sliders would detract from this harness, so I was very surprised when I got to play with it and see how well it was put together. The extra straps tuck in nicely, and don't leave too much unpadded length. I think my favorite feature of this harness is the buckles themselves. Not only are they curved to fit the shape of the dog, they are also wrapped in little elastic sleeves that help keep crud out of the buckle! Have you ever had a quick-release side-squeeze buckle get gunked up with sand or mud? Obviously someone at Alpine Outfitters did too. This is truly an all-purpose harness. It's awesome for regular walking, stays well clear of the dog's throat, and is padded to prevent chafing. The buckle at the neck means I don't have to pull it over anyone's head. It's comfortable to pull in, I've had Sis Godzilla help pull my wagon full of agility stuff from the car to the field. Basically the Urban Trails harness works for any activity where the line attaches to something higher than the dog's back. So, not sledding or weight pull or carting with shafts, but anything else. In a stroke of pure genius, the folks at Alpine Outfitters have added a ring at the front of the harness. 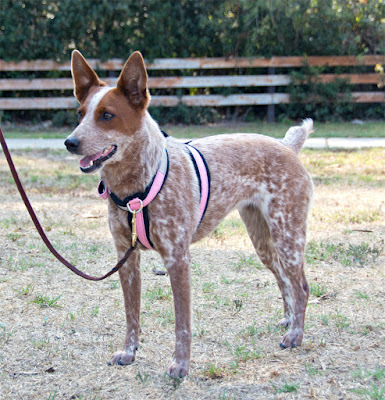 When the leash is attached to this ring, it can be used as a no-pull harness. That's right, the best pulling harness can also be used the most comfortable no-pull harness. Alpine Outfitters now makes a backpack accessory for the Urban Trails Harness. It's designed to fit over the shoulders, keeping the weight off the dog's back. The pack also allows free movement of the shoulders, and sits nicely against their body so it's comfortable to wear on adventures. Pros: Adjustable to fit different dogs. Reflective. Padded with non-absorbent polar fleece made mostly from recycled materials. Made in the USA. 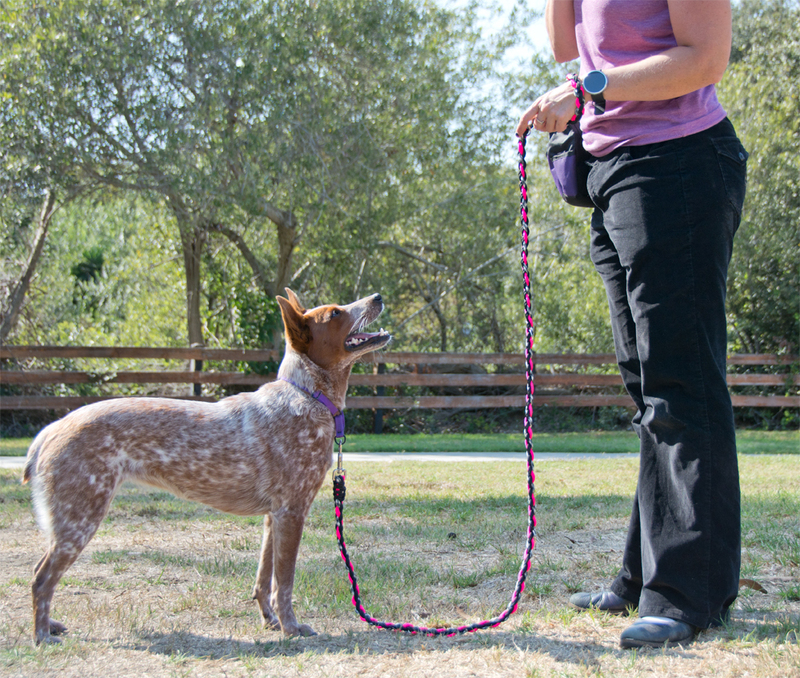 Front leash ring also allows harness to be used to discourage pulling. Really spectacular and personal customer service. Cons: I'm a bit worried that the light pink color is going to get really dirty really fast. That's what I'm testing now. Bottom Line: Whether you're using a bike, scooter, skis, skateboard, or baby stroller, this is definitely the harness you want. Dog with super sensitive skin? Right here. Got a hard to fit dog? Drop them a line and they'll happily help you figure out the right size. 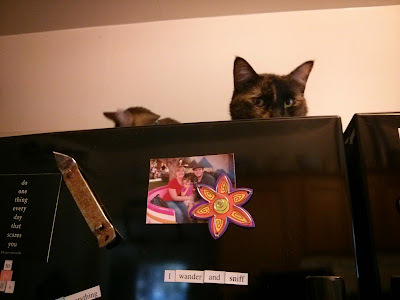 It's Saturday, time to share a little bit about my cats, The Hellions. We are currently staying with family who own five cats, so now there are seven cats in the house. How do we keep the peace?There are a lot of ways to help reduce inter-kitty conflict, but they aren't always intuitive. Years ago, I read a paper on reducing conflict between cats in the same household. It started by explaining how wild cats share territory and resources. African lions are well-known for living in family groups, but most feline species live and hunt alone. Territories frequently overlap, and more than one animal may use the same water source or hunting grounds. Wild cats avoid conflicts with other individuals by simply avoiding one another. (This also works really well for misanthropic humans.) If another cat is getting a drink, they either wait or go find somewhere else to drink. We make it difficult for our domestic cats to practice proper kitty misanthropy. Having one bowl of water, one bowl of food, and one litterbox for multiple cats sets them up to come nose-to-nose multiple times a day. It also gives them the opportunity to go on little kitty power trips. "Oh, you wanted to get a drink? Well I'm just going to hang out here by the water dish...until you die." Some housecats are good at sharing, they have functional family groups just like a pride of lions, or a family of cheetahs. 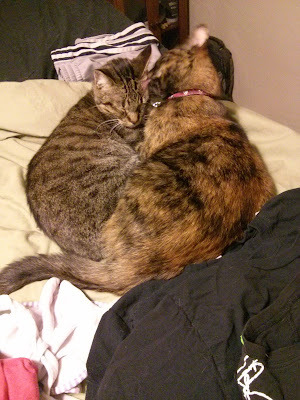 Cats that are genuinely social, rather than just tolerating, tend to groom each other and snuggle up together. They don't usually mind sharing resources with their buddy. James and Solstice are littermates that are very social together, but not with other cats. They can share a puzzle bowl or a nap spot. When it's not super hot, they can often be found wrapped up in a heap. However, they do have their disagreements so I like to make sure they each have their own bowl of squishy food, and more than one place to get water or use a litterbox. Dogs are easy, dogs live on the ground. Humans also live on the ground, and I think we forget that not all pets are happy down here on a single plane of existence. Cats LOVE vertical space. Having places to climb and perch makes them feel safe and secure. It also helps keep them from coming nose to nose with the other cats in the household. If a room is relatively uncluttered, a cat on the floor is in direct line of sight with any other cat that enters. If they have a nice place above floor-level, they can watch the other cat pass through without stressing about it. Vertical space is also an excellent way to prevent or reduce conflict between dogs and cats. Cats feel more secure when they can easily get out of reach, and dogs don't usually get the urge to chase a cat that's hanging out on top of the fridge. 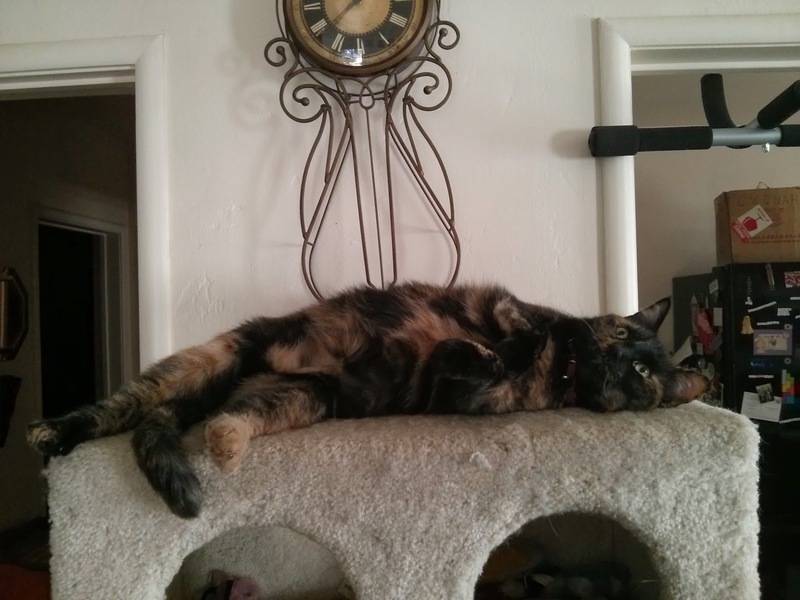 Carpeted cat trees are an obvious choice for elevated cat hangouts, but not everyone has the space, money, or aesthetic for those. SuperZoo had some really neat suction-mounted shelves, beds, and bowls, as well as a cat tree that hangs on the back of a door! I am particularly fond of wall shelves as cat space, you can make them fit any space and decor. My current project is a set of wall shelves for James and Solstice, to help them move around the bedroom without getting down at dog-level. Ready-made shelves and brackets are easy to find at the hardware store, but I'm planning to staple carpet or something onto mine to make sure they have some grip in case they lose their balance. Shelves can also help give your cats access to existing high spaces in your home, like the tops of cabinets and bookshelves. I like to have things arranged so that the cats can travel through most of the house without touching the floor. When I buy a house, I fully intend to make cutouts in the walls so The Hellions don't have to bother with doorways.